I won't throw them away. I plan to hold onto as many of the stock pieces as I can in case my daughter ever wants to turn it back into a street car. I've been traveling more than usual for work, so I haven't had much time to spend on the Eagle, and yesterday, while I was racing my Mustang, I broke the torque arm and the rear shocks, so I have a little repair work to do before the November race in Ohio. However, I need to make up some time on the Eagle, and since I have not been able to find a set of front subframe rails in any better shape than mine, I'm going to start cutting all of the rusty parts off of them to see if there's any chance that I could repair them. I'll post some pictures once I find out if there's anything left in them that can be saved. I picked up a 1984 SVO Mustang turbo that jumped in front of the Eagle on my project list, but I recently found a potential donor car for the front subframes. Does anybody know if the subframes from a 1985 Eagle four-door sedan would interchange with the ones on my 1981 SX/4? From the pictures I've seen, they look like they're the same, but I'd like to know for sure because the car is a few states away. If anyone could let me know one way or the other, I would appreciate it. I THINK I've read all Eagles are the same from forward of the windshield, but I'm not sure. I've heard the same. 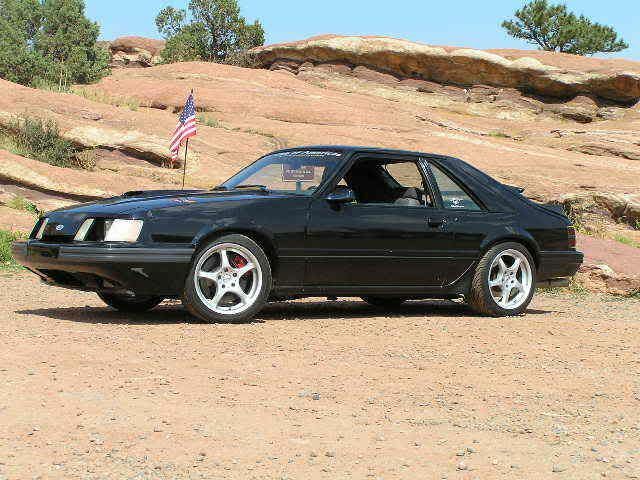 I owned an 84 SVO for 22.5 years. That's in much better shape than mine, which is why I don't feel too bad modifying mine for dirt track use. I'm swapping in an 8.8 rearend with 31-spline axles and 3.73's, and I have all of the newer turbo gear from a 1988 Turbo Coupe. I'm also going to run a Panhard bar and a torque arm for the rear suspension. Are those 2000 Cobra R wheels you had on it? I have a set of those for my 5.0, but I thought they had the wrong backspacing for the SVO. In that picture, it looks like they fit great. No, those are 17x9 Konig Villians that I got from Maximum Motorsports. It also had an 8.8 with 3.73s, V8 T5 and 99 Cobra front spindles and control arms and Cobra brakes all around. I did some trading and I lost out on the deal and the guy I traded it to, put a larger turbo on it, put a hole in the block and then parted it out. I had it for over 22 years and he had it for 4 months. That's really too bad, but at least you got to enjoy the car a lot longer than the other guy! I had it for over 22 years and he had it for 4 months. Interested on how this 'frame' swap turns out. I've got a similar situation & was gonna sell it for parts. Someone in Detroit has a 1982 SX/4 for sale right now for around $2K and he says the floor has been repaired and the subframes are already tied, but I'm not at the point yet where I want to abandon the car I have. I feel like I'm obligated to turn this one into a race car because it's in such bad shape that no one would ever try to restore it back to its original condition, but it seems to still have a strong will to live. That being said however, there are days when it seems like I should have started with one that was less rusty! My daughter and I made it to Minnesota last night and we purchased the donor Eagle, a 1985 sedan that experienced a small fire. We made it back from Montana, and I started disassembling the donor car before I even got it off the trailer. In spite of its appearance from the fire, the underside of the car is surprisingly solid. I'm excited to remove the parts I need, but I'm going to have to remove the scorched engine (another reason that plastic valve covers aren't a good idea) and the front suspension before I can get to the subframe. Unfortunately, I have a Dakota with leaking freeze plugs in the garage that's in line ahead of the Eagle project, but I just got the transmission out today, so if I can find some new (brass) freeze plugs tomorrow, I'll be able to put it back together and get it out of here. I've already been able to salvage the door hinge mounting plates and bolts from the 1985 Eagle to replace the ones that broke on the SX/4, and I bet I'll be able to reuse a bunch of parts like that before I'm done. I haven't ordered the roll cage yet, but I think I should before I get too much farther into the fabrication so I can make sure the mounting plates will be in the proper places. I'm also wondering if it would make sense for me to cut the inner rocker panels out of the 1985 and shorten them for the SX/4. I'll have to see if that will be less work than having new ones made for the SX/4. I still have to swap the rear axle on the SVO Mustang, but I feel like the Eagle project is picking up a little speed again. I'll post more pictures as I get further into it. I also need to decide if it would be worth the trouble to swap the inner fenders from the 1985 to the SX/4 as well, but I think it will probably be easier to just patch up the thin spots. I got the donor car off the trailer and into the barn today so the two Eagles can spend a little time together before they join forces to make one solid car.